I've seen it occasionally in Europe as well, but certainly not something you'll encounter every day. That said, asphalt can be made in virtually any color. We have red bicycle lanes in the Netherlands. They might have been painted red or had some red colour mixed into the asphalt. It doesn't make a lot of sense trucking in red asphalt from far away just to make the bike lanes. Red asphalt is prominent west of the Greater Toronto area. The 401 in region of Waterloo (city of Kitchener) is almost entirely red asphalt. However, as widening and resurfacing projects continue, black asphalt will continue to replace it. Extending the collector/express system to Kitchener is in the Ontario Ministry of Transportation's long term planning list. However, it probably won't happen until the 2030's if it even happens at all. There's talk of adding a HOV lane and an extra travel lane or two in each direction as an alternative. Either plan is good, because the population of this region is exploding and it is a bedroom community of Toronto. What they really need to consider is either making a new highway or building a true HSR or full commuter rail line from K/W to Toronto and London. EDIT: While I'm talking about Kitchener, there are plans for upgrading the highway 401/8 interchange. This is the busiest major junction in the region. -Expected completion is 2017. The preferred design is to have it accommodate a wider road or future collector/express system and have it end here. There are a lot of lanes here, but even more are needed to reduce congestion and improve overall traffic flow. If more lanes are needed than a cheap way of doing it would be to convert the shoulders into running lanes during busy periods. That ought to give an extra four lanes at minimal cost. That will never happen. Paved inner and outer shoulders are a minimum safety design standard here, no matter what time of day it is. It looks like there is room for an extra lane or two on the collector carriageways, but due to the median the express lanes cannot be widened. Even if the median was destroyed and moved there are several support pillars from the 400 interchange that connect with the median. Needless to say, if you want to significantly widen the road, significant reconstruction of interchanges is needed. The right of way could easily accommodate many more lanes if the basketweave were removed/reconstructed. Left shoulders are really not necessary when there are only 3 lanes on a roadway. I think it is recommended from 4 lanes or more, but 5 lanes and no left shoulders are common as well.. However, using US Interstate standards (which seem to be followed in Ontario), one needs a full left shoulder when a roadway is 3 lanes or more. Modern safety design standards here require a full paved shoulder on the left and right side of the carriageway along with a median. I think left and right shoulders for 2+2 is a little over the top. I always thought the UK had the one of the most toughest requirements for freeway standard roads yet even our 6+6 doesn't have shoulders along the median, see here. This is one of the narrower modern (lane added in 2008-9) medians I can think of (I-55 in Will County, Illinois). It's a pre-Interstate freeway (built 1956) that recently had the left lane added. It makes for interesting rush hour driving when someone breaks down on the left. By contrast, here's a section of I-55 in DuPage County with a much wider shoulder. Of course, the 1989 orbit study looking at how wide the M25 should be (and ruling that the 6x6 bit has the traffic for 5 lanes each way then - only waiting about 17 years for it to finally be widened!) decided that you shouldn't have 5-lane motorway carriageways (but do 3+2, 3+3, 4+2 or 4+3 instead) and also that any carriageway 4 lanes wide and above should have inside shoulders. I think the M2 heading out of Belfast is the only road in the UK to have had inside shoulders as part of a permanent plan (parts since turned into another lane), as opposed to a temporary solution to stop there being a capacity decrease where there's not a junction until the road is upgraded further (eg A1(M) at Hook Moor, before the bit south of Micklefield was built). That's one of the reasons why Ontario has the safest roads in North America year after year after year I guess. Ontario has a lot more freeway travels than average in Canada, and freeways happen to be the safest roads around. I see no need for a jersey barrier if its less than 3 lanes. A median cable-type barrier makes more sense. A left shoulder is also not needed as the left lane is traditionally the fast lane. 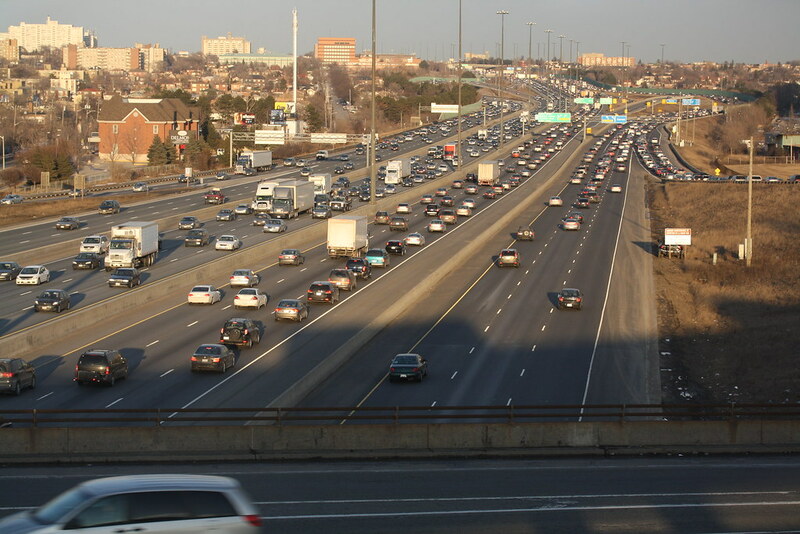 I mentioned on the a tread regarding adding more lanes on the 401 and other freeways in the Toronto area on the fictional freeways section of the forum. I mentioned about the need to build more freeways in that area. The problem with that is that there were too much opposition. The issue with rebuilding or widening of an freeway, especially in urban areas, is that you have to worry about a residence to be seized to allow it. The closure of a particular ramp could prompt travel roads that already can't take the load as it is, creating more congestion on both the freeway and the adjacent roads. I used to drive the 401 a lot in the 80s, when my relatives in Toronto were alive. I recall gravel shoulders from [insert destination - S] to London. When did those go? Also keep in mind that the 401 (along with the other 400-series highways) is in Canada. Having left and right shoulders means there's a place to put all that snow when the plows come by. In the wider sections of the 401, the snowplows join in a large formation and clear the highway in one fowl swoop. They also don't care about traffic, so you usually see a ton of cars following the plows from behind. I guess if they cared about traffic, they'd never get it done. They've done the same thing on I-279 here in the North Hills of Pittsburgh. I remember it mostly when we had the Blizzard of '93 video's. Here's two shots of some construction along Highway 401 in Mississauga I took on Saturday. When complete, the road will be widened from 6 to 12 lanes, and have a collector/express system west of Highway 403 and 410. The interchange with Hurontario Street will also be reconstructed as part of the project. Forgive the bad weather and image quality. I was trying out a new camera, and I think I am going to return it based on the results. "I'd like to return this camera; every time I try to take a picture, it's cloudy!" It seems like your photos are being saved at a high-compression/low-quality JPEG setting. Have you tried playing with that option on your camera, to see if saving at the highest possible quality (largest file size) has an effect? Nah I wasn't just these pictures, all the images from my camera are grainy. I was using this. I think I might upgrade to this. I had a lot more pictures too, but they all came out blury. Grainy images are caused by high ISO. By default cameras are set to automatically adjust the ISO to suit the lighting. Dull and dark conditions will cause the camera to increase the sensitivity (ISO) to keep the shutter speed high but this also causes noise (grain) because of the camera's high pixel density. Try setting the ISO to manual and select the lowest option - 80 to 100 depending on the camera. If you want clean images at higher ISO's you'll need a camera with a bigger sensor. This is the camera I use most often for road pictures although mine is the older non S version. A new video has been made today showing Highway 401's most congested and widest points. I recognise the eastbound queue at Eglinton Ave. When I drove that section last year the eastbound lanes were crawling on both occasions. That explains the orange lines for the lanes. Here's a rare pic: Highway 401 with no traffic! This section of the highway was closed during the 2008 Toronto Propane Explosion as a safety measure due to it's proximity to the main blasts. It reminds me of those wide, deserted highways in North Korea.